If you’ve ever hosted any event, then you know coming up with the perfect name is often difficult. Vision board parties are no different. Giving your vision board party the right name will help to attract the right type of people to your event and help you communicate exactly what your event is about. Given the nature of vision boards, you’ll obviously want to create a name that is inspiring and motivating. However, there are other things that you can do to make sure you’re getting your point across clearly. Who would you like to attend your event? Are you specifically looking to target people in a particular industry? Is your event for business owners? Is your event specifically for students? If you want to attract a specific person, then you should use that information to drive the name of your event. If your event is targeting local creatives, then naming your event “A Colorful Future: The Vision Board Party For Creatives” will let people know that you are directly targeting them and that they can expect to meet other local creatives. By using the target audience directly in the name of the event, you are choosing a particular niche and it helps to drive the activities, setting, décor, and food. It will also help set expectations for the people attending. What problems are you trying to solve with your event? For example, are you helping moms get better balance in their life? Are you primarily focused on helping people pay off their debt and create a better financial situation for themselves? Do you want to create a vision board party to help others? 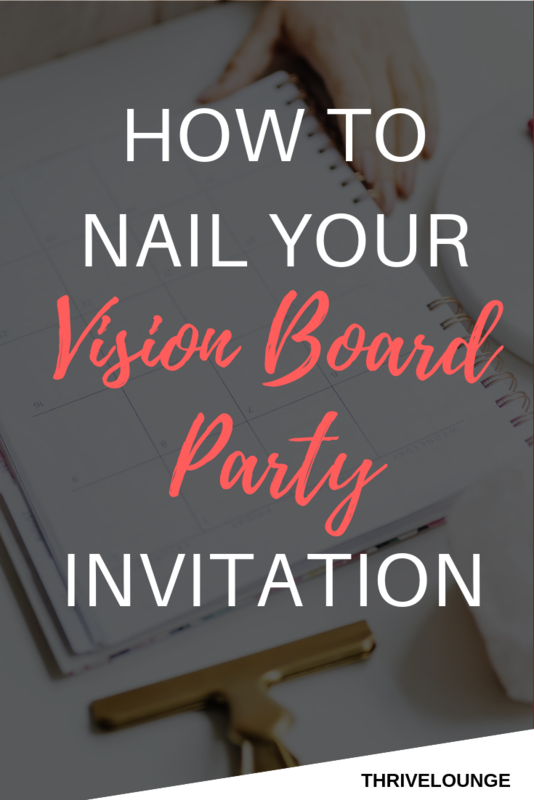 I’m sure you’d like your vision board party to help someone do something (even if it’s just to get a night out to socialize and to have some time to focus on their goals). You can build that information right into the name of the event. For example, if your event will specifically speak to how to set and achieve goals, then a great name for your vision board party might be “The Goal Getter’s Vision Board Party.” This shows both who this event is for (anyone who wants to focus on their goals) and exactly what the main focus of he event will be (goal-getting). In that case, you could name the vision board party according to the theme of the event. The first vision board party I attended was a potluck where family and friends gathered together. It was called ‘The Vision Lounge’ and it was appropriately named reflecting that we were there to drink wine, socialize, chat about life and have a great time. The name directly mirrored the way we felt at the vision board party. When you’re hosting a vision board party, I would encourage you not to overthink about the name. The most important part about a vision board party is the experience. As you consider the name, think deeply about what type of experience you want people to have along the way. As long as those two things are aligned, you’ll be on the right track. Want To Start Planning Your Vision Board Party? 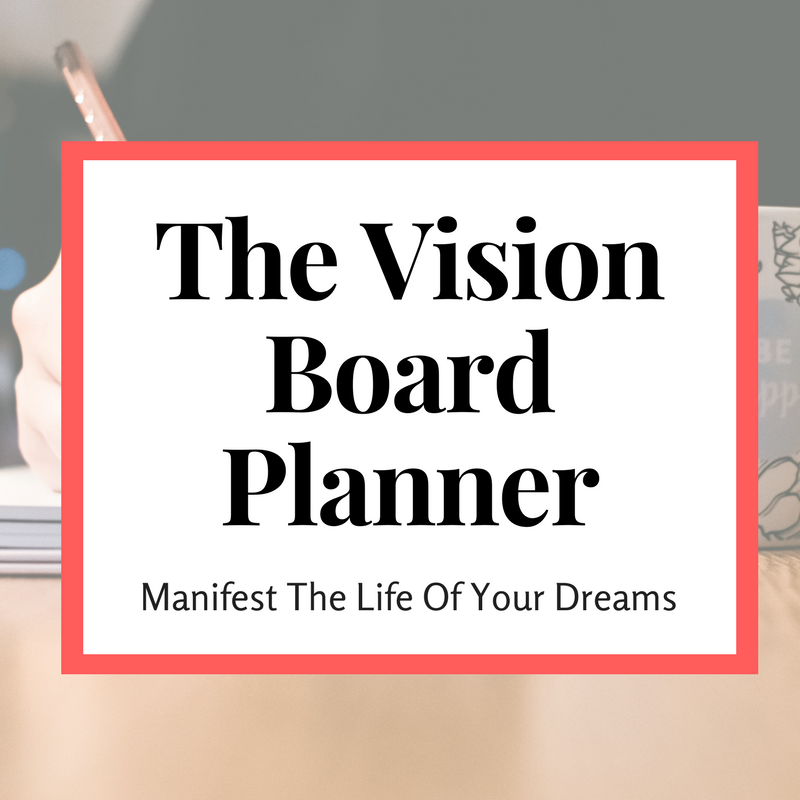 Download the FREE vision board party planning checklist. Check out our top resources for hosting a vision board party. Are you a coach or educator looking to host a profitable vision board party? Start the Sold Out Vision Board Parties Course. Chantl founded Thrive Lounge to give women the kick in the pants they need (lovingly, of course) to uncomplicate their goals, stop making excuses, get productive and start living the life they always wanted. Her Sold Out Vision Board Parties, online course, helps success and mindfulness coaches host profitable, effective and transformative vision board parties. Ready To Plan Your Next Vision Board Party? Grab the party planning checklist I use to plan easy breezy (and totally unforgettable) vision board parties for my fav ladies! Happy Party Planning! Congrats on taking the first step to creating a BIG vision with your fav BFFs! When I started on my goal-getter journey, I wanted a community to share it with. I wanted to help friends (and myself) reach goals with support along the way. I wanted people I could lean on in difficult times and I wanted to be the same type of support for others. That’s why I decided to host my very first vision board party for my friends. I sent out a few text messages, telling them to show up at my house with their favorite choice of food for a potluck vision board party. Although we had a great time, three attendees was not ideal because I wanted to make a larger impact. I wanted to help LOTS of people change their live, but I could only do that if LOTS of people showed up. Over the past few years, I’ve learned how to host a vision board party where people are excited to show up and share their goals, connect with other women, tell their stories and start a new year - refreshed. It all starts with inviting the right people who will be interested in your message, and inviting them in a way that gets them really excited to attend. When you're creating your invitation for the vision board party, you want to make sure you include all the necessary information. Vision boards have been popularized in recent years, but many people still have never heard of them. If your friends don’t know what a vision board is and what it does, it’ll be harder for them to get excited about coming to the party. If you’re asking your guests to bring anything to the event, then make sure you let them know that right in the invitation. For example, if you’re hosting a potluck, then make sure they know to bring a bottle or dish, ask them to send over any dietary restrictions and make a public list where friends can add in their selections. You might also want guests to bring their own magazines to the event because a large number of magazines might be difficult to come by for a larger group. If you have spent money up front to rent a large space so that lots of friends and family can attend, or if you are providing the food and drink or purchased vision board materials, it might make sense to ask guests to pay a small fee to come to the party. In your invitation, make sure guests know what they need to pay in order to attend the event and let them know exactly what they’re getting for their money. Finally, give them a way to pay for the cost of the event. Sometimes hosts like to give their guests a workbook to get them thinking about the goals they want to set for the new year. If you plan on giving your guests some pre-work leading up to the event, include the link to the pre-event materials in the invitation or how to access them. When you include all of the necessary information upfront, then your guests won’t have any confusion about what the event is, and they’ll know why they should be excited about attending. The next thing you need to think about is exactly how you are delivering this invitation to your guests. In my experience, texting your friends is not always the most effective way to show that this event will help them reach a new level of success. The invitation is a direct reflection of what the event will be. When your guests receive an invitation that feels special, well-thought-out, organized, and warm, they’ll believe that the event will feel that way as well. When I’m looking for something specialized and adorable, I head straight to Etsy. Here, you can get creators all over the world to customize a beautiful template of your choosing with your specific information on it. This is a great option for people who do not have the time or design skills to edit their own invitations. You simply choose your template and send over your event information to a creator and viola! You have beautiful invitations that you can print out and send to friends or download and email in a few days. If you have some experience with Canva, you can also purchase vision board party designs that you can customize on your own. This gives you a lot more flexibility with what information is included in your invitation, what pictures you use (if any) and you can even add your own event colors. I’m a huge fan of the simple Facebook event. Most people are on Facebook anyway so having your event information there makes it super easy to invite friends to attend. Eventbrite is a well known website for finding local events. Anyone can go onto Eventbrite and create their own event and it will immediately become available to your community. This is a great option if you’re hosting a larger event in an event space because anyone in your community looking for events can find you. If you’re asking for a payment to attend your event, eventbrite does have a very simple payment system that collects your payments and deposits the money into your account right after the event. This method works well if you already have a list of people you’d like to invite to your event - and you have their email addresses. Wow. This has been an amazing year, hasn't it? At the end of each year, we love getting the #ThriveSquad crew together to celebrate our wins from the past year and chat about our goals for the upcoming year - and this year will be no different! This year's vision board party is... A POTLUCK! You and all your goal-getting friends are invited to bring your best shareable recipes (or your store-bought favs #NoShade). Join us for an evening of great food, amazing conversations with brilliant women, and bottomless wine because that's the way we roll! In this email, I’ve inserted a lot of my personality along with all of the information they need to make a decision on whether they want to attend the event and how to purchase their ticket. Vision board parties are a great way to get your friends and family thinking about their goals. The invitation is the most important piece of the puzzle because it’s the first impression that people have about the quality of the event. Make sure you always send out an invitation that truly reflects the beauty, inspiration, and positivity of your upcoming vision board party. Grab the FREE party planning checklist I use to plan easy breezy (and totally unforgettable) vision board parties! Subscribe to the newsletter for regular updates and instant access to the checklist! Chantl founded Thrive Lounge to give women the kick in the pants they need (lovingly, of course) to uncomplicate their goals, stop making excuses, get productive and start living the life they always wanted. Her Sold Out Vision Board Parties online course, helps success and mindfulness coaches host profitable, effective and transformative vision board parties.